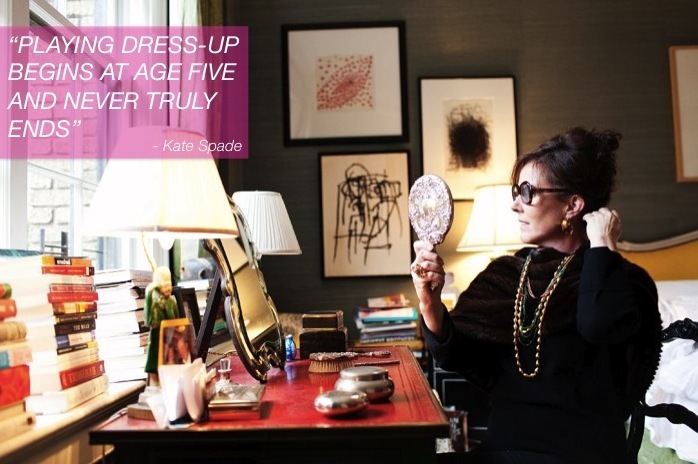 "Playing dress-up begins at age five and never truly ends"- I love this quote from Kate Spade, it is so true, in more ways then one. Spade's words also perfectly embraces the bright colors, elegant silhouettes, and pretty patterns her clothing and accessories are known for. Many many years ago I received a Kate Spade handbag for my 15th birthday and it was everything to me. Now a days I'm pretty in love with her shoes. They have the perfect combination of sophistication and whimsy. If you haven't seen Kate Spade's spring collection yet, check out some of my favorites below. This is one of my favorite quotes! lol. Oh wise Kate. I certainly began at an early age. Kate gets me every time - I don't think I can walk in that store and not start drooling! Agree with this quote! And the picture is sooooostylish! You are so lucky to have a piece of the Kate Spade collection at such an early age Chelsea....love her amazing pieces!!! And that QOTD is soooo true! !